Words that come to mind that describe this store is classy, chic and modern. Located in Greenvale, NY, our newest Brooks Brothers installation will definitely give you a feeling of home and comfort. Its clean lines and laid back atmosphere give customers a chance to shop as if they are right in their living room! 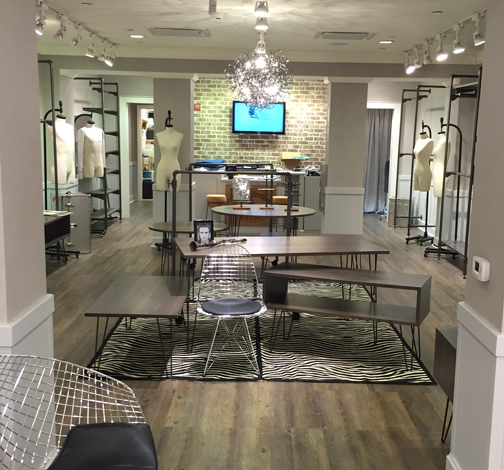 The wall system we used for this store was our fashionable Pipe Fixture System in powder coat anthracite gray. The store’s pleasing muted color palette of earth tones combined with poplar wood tops on custom-made hair pin table legs gives a clear sense of how beautiful a mixture of modern and vintage can be. For more information and photos of our Pipe Retail Fixture System, follow the link. For more information on custom opportunities, call, email, or visit us in our showroom in Toronto.